Valco’s patented Tube-Grip® greatly improves the handling and dispensing of All-In-One Silicone™ or any material packaged in a flexible tube. The Tube-Grip dispenses material accurately and efficiently. In fact, the Tube-Grip maximizes the usage of all the material in the tube due to its effective means of application. Tube material can also be dispensed in a wider variety of patterns. For example, you can easily use a small orifice tip for a very fine precision line, or it can be dispensed in a flat, ribbon-type pattern. 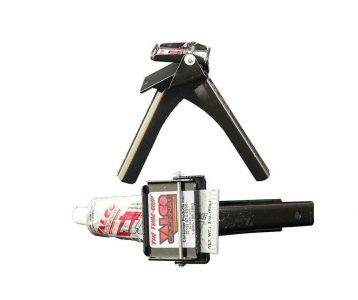 The Tube Grip can dispense the thickest sealant through a very small opening, permitting better application control. The Tube Grip reduces both cleanup time and the possibility of skin contact or other problems caused by excess material squeeze-out. Tube Grip Despesning Pliers will be added to Cart!